Recently whilst travelling along the north-west coast here in the UK I was shocked to see outside a farm veal crates rather like those you see in the picture below – at least I thought these were veal crates. Except these contraptions are not veal crates as I later found out. Veal crates are literally that, crates, like the one in the following photo. Here in this tight confinement this poor little newborn calf and millions of others like him will remain until they are slaughtered for veal. 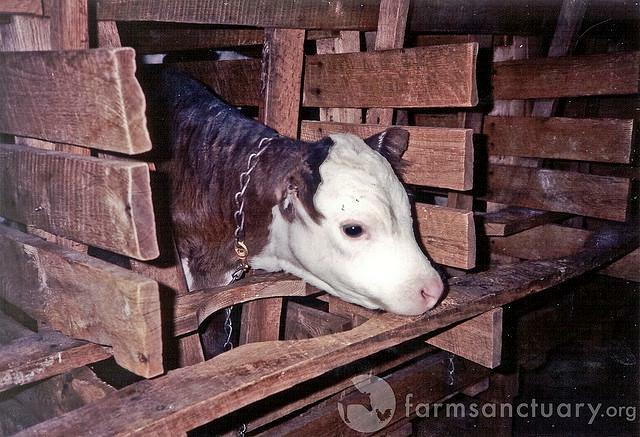 The veal crate is a wooden restraining device that is the veal calf’s permanent home. It is so small (22″ x 54″) that the calves cannot turn around or even lie down and stretch and is the ultimate in high-profit, confinement animal agriculture. Designed to prevent movement (exercise), the crate does its job of atrophying the calves’ muscles, thus producing tender “gourmet” veal. About 14 weeks after their birth, the calves are slaughtered. The quality of this “food,” laden with chemicals, lacking in fiber and other nutrients, diseased and processed, is another matter. The real issue is the calves’ experience. During their brief lives, they never see the sun or touch the Earth. They never see or taste the grass. Their anemic bodies crave proper sustenance. Their muscles ache for freedom and exercise. They long for maternal care. They are kept in darkness except to be fed two to three times a day for 20 minutes. The calves have committed no crime, yet have been sentenced to a fate comparable to any Nazi concentration camp. Apparently veal crates like the one above have been banned in the UK and throughout the EU but are still in use in many countries . 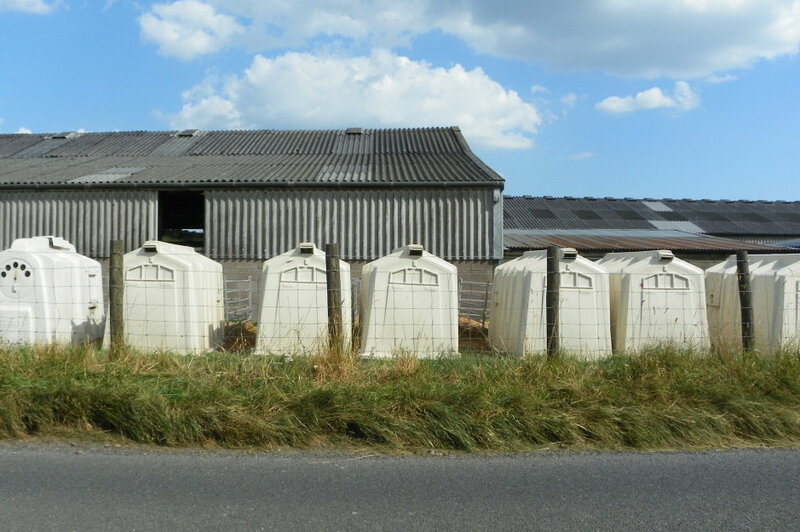 Calves though continue to suffer as they are housed in isolation in these plastic hutches. As with the veal crates a calf will spend his first few months of life in these tiny plastic contraptions away from his mother and other calves until he is eventually slaughtered. These hutches if used in accordance with the animal welfare ruling here in the UK should provide a hay rack and a tiny outside pen as you see in the picture below. Though this picture is from the USA the set up is similar. 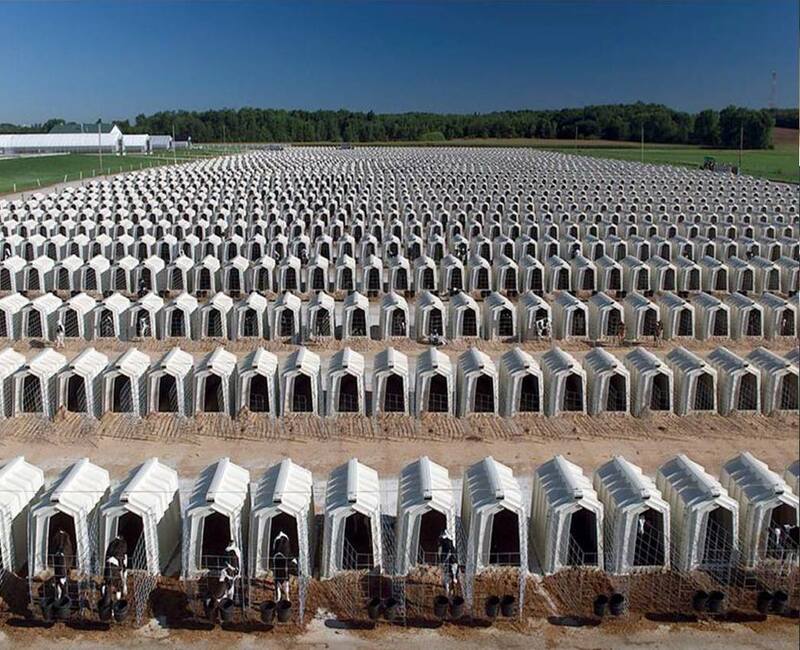 When I first saw this image, I momentarily mistook it for a cemetery, one of those filled with long, neat rows of unmarked graves or “unknowns.” How fitting, then, that what it actually is is a photo of dairy calves in hutches. Calves born to dairy cows are torn from their mothers within hours of birth, in order for humans to steal the milk intended for them. Male calves are sold to auction to be slaughtered for veal or cheap beef, while female calves are typically raised in “calf hutches,” little plastic igloos or dog-house-type structures with a few feet of fenced in dirt in front. They live this way, in complete isolation, for the first 2 to 3 months of their lives. They do not leave the hutches to run or play, and in order to prevent the possibility of young calves spreading sickness amongst themselves (a potential profit loss), they are not even allowed to touch each other. This, during the time when they are most in need of touch, most of all from their own mothers, with whom they would normally be grazing, nuzzling, and experiencing the greatest bond any mammal ever knows. Read more about these hutches. Though the information included refers to the USA the same applies here in the UK and in many countries around the world. Though they are an improvement to the crate system as they let in light and fresh air and allow some small increase in movement, albeit in a tiny pen outside, and the calves are provided with hay and are not standing on a concrete floor, they are nonetheless a cruel confinement. In many countries both veal crates and hutches are used. The hutches are used for a while before the calves are put into a group pen. The idea is supposedly to help them develop an immune system. The hutch system is still nowhere near not good enough, conditions for calves need to be vastly improved. Cattle should be in meadows within social groups the mother rearing her calf. Though the obvious solution and the only humane and ethical one is of course to stop rearing and slaughtering animals for meat and other products. The plastic hutches are a small improvement but still inhumane. Going outside is a bit of a stretch and only applies if taken literally for the pen enclosure provides nothing more than a few feet of fenced in dirt, no room to walk let alone run and experience the freedom of movement so vital to the well-being of any animal, most particular baby animals. Calves not only bake in hutches in the noon-day sun in California, they freeze after winter calving in Maryland. These hutches are for heifer calves on St Brigid’s Dairy in Maryland US. 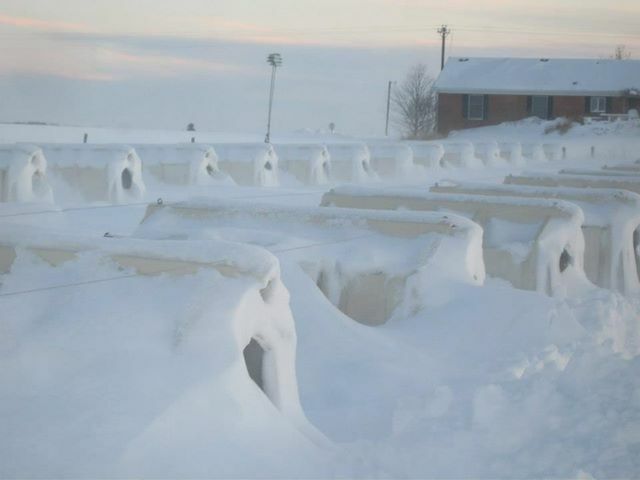 Photos taken after a blizzard in 2010. Here are examples of the measurements of these plastic contraptions – very hot I would think in the summertime anywhere in the world. http://www.youtube.com/watch?v=rwcfh9e0OGA – this is a commercial to sell these awful hutches. Notice comments has been disabled. Perhaps they are not too keen to know what people think of their cruel inhumane methods of farming. I have to say it saddens me greatly to think of these baby animals stuck in these tiny hutches away from their mothers, even though there is more space than the former crates it is still very small and does not allow any real movement of any significance. Maybe a tiny improvement on veal crates though keep in mind they are not the same thing and the production of traditional veal still requires the poor creature to be stuck in a veal crate in the dark, unable to move. The hutches are still nonetheless a tight confinement for a young animal full of life and vigour. An animal who wishes to run about unrestricted to be with his mother and other calves. Veal crates are usually for male calves only because they are not useful for milk production. Some female calves are also turned into veal because they are not needed for dairy production. The excess dairy calves who are considered to be the wrong breed to be useful for beef production are usually slaughtered for veal when they are between 8 and 16 weeks old. There was no safe place to stop and there was in any case no one about. But had there been I would have liked to have asked the farmer how he could place into this tight container a thinking feeling living sentient being. A baby calf born only an hour before being torn away from his mother. I would like to ask what kind of person has the heart mind and mentality to commit such a horrendous act of cruelty to a living creature. Remember veal crates are containers into which is placed a newborn calf that was taken from his mother one hour after being born. This is all this poor animal will see for his or her short and tragic life. For here in this tight confinement the calf will remain until he is slaughtered to provide veal – usually for the more affluent members of our society. Think before you eat. All meat is inhumane, death is inhumane. To take the life of a sentient being who like you or I wishes to live – the instinct for survival is of course one of the most powerful instincts found in both human and non human animals. – is a crime, nothing less. The sickening cruelty of veal crates and plastic hutches is shocking in the extreme, it is undertaken to make money and cannot be justified in any way even by many of those who continue with an omnivorous diet. Veal and beef of course are not the only issue with cattle farming – remember veal of course is a by product of dairying. Did you know that our love of milk here in the UK sees an estimated 100,000 to 150,000 male dairy calves shot within hours of birth. This French video clip (an excerpt form a new documentary by French filmmaker Beatrice Limare called “Adieu, veau, vache, cochon, couvée“) depicts that breaking of the bond between a dairy cow and her newborn calf. There is no physical violence, blood or gore here. Just something perhaps far worse: the psychological anguish of the deepest bond imaginable in the mammalian world: the bond of a mother and child. Is your glass of milk really worth all this sickening cruelty. Look at the faces of these babies how can anyone who wishes to be called human cause them to suffer in this way for a food we do not need. Think about it no other animal drinks milk after weaning and no other animal drinks the milk of another species. If you are not ashamed to be human than you should be.I often wonder if there are any other living sentient beings in the universe who have evolved to be compassionate and what they would think of our treatment of the other species with whom we share this world. I hope in time in the not too distant future that we no longer rear animals for food or any other commodity and that we allow them to live in accordance with their nature, free to live as they so please. This entry was posted in Animal Rights and tagged Animal Rights, animal welfare, cattle, cows calf, plastic hitches, veal crates. Bookmark the permalink. Depictions of those small enclosures always evokes comparison (in my mind) to the ‘barracks’ of Auschwitz. Shameful beyond words. Thank you for your comment. I was very shocked when I first saw these awful plastic hutches, how can people be so cruel. I wholeheartedly agree with your comparison. In fact our treatment of animals is comparable to the holocaust in many ways. What people fail to realize is this. One must accept being cause for the problem, when they wake up each morning and step outside an apartment or residential housing neighborhood where they reside, and travel the pavement to … a grocery store… to buy their nourishment. Period. We are meat eaters. Our preference comes with a responsibility of providing a home that includes areas to raise our own meat that are just as comfortable as the area where we exist on a daily basis. We grow our own food, besides holding down mainstream society jobs. Rather than bashing and complaining… it would be so much more beneficial to this entire world if… you would get yourself busy with teaching children where their food comes from… by showing them your own efforts for a perfect example. Yes of course people need to know that they’ re the cause of the problem that is the whole point of as you say my “bashing and complaining” hoping somewhere along the line someone will take notice. Good for you that you grow your own food but obviously this is not an option for most people, which surely you must realise. Yes children need to know where their food comes from but be encouraged not to eat meat rather than produce their own which in addition to the ethical issues is obviously not practical for everyone. Wouldn’t it be better to teach children compassion and respect for the other animals who share this world with us rather than view them as food? It’s good you keep animals in a better environment than a factory farm but at the end of the day they still die to provide you with a food that really you do not need. Meat eating is not natural. How can it be, we do not have the anatomy of a meat eater? Would you be able to kill an animal and eat it’s flesh without the aid of a weapon or other tool as real carnivores do? Of course not. How can meat be a natural food if it needs cooking, no another animals cooks its food do they? I will carry on writing about the exploitation of animals as given my circumstances that is all I can do. I make an effort by going vegan, protesting, joining campaigns and so on. With my so-called “bashing and complaining” I hope to spread the message where our food comes from. For the vast majority of the world’s people who are not as privileged to have the resources to produce their own food it is better for them to abandon the eating of meat altogether. It is better for animals, other humans and the environment to stop eating meat. Even if you do provide the optimum in animal welfare, what right have you to kill an animal for a food you do not need and is not natural ? At the end of the day you have killed a sentient being, a creature who wants to live as much as you. Animals have a right to life as do you or I, it is as simple as that. The right was given to us all… in the bible. God gave us dominion over the animals for more than one reason. Imagine the possible over-population by every species…which has already been proven to create cannibalism in every species, if allowed to run rampant without anything more than seeing eyes. No matter how much space you create… only so many bodies will fit. And only so much food can grow. When the bodies outgrow the food… chaos enters to create nightmares. There has to be order in the chaos… somewhere. I knew it! The usual distorted Christian rhetoric used to justify eating meat which has no basis in Christianity. “And God said, Behold, I have given you every herb-bearing seed which is upon the face of the earth, and every tree in which is the fruit of a tree yielding seed: to you it shall be as meat…. Genesis 1:29 Christian Bible old testament. From the context of the passage in this earlier translation it is obvious that the word meat is of course not used in the literal sense at all. The king James bible was written in 1611, in the 17th century the word meat was used to refer to a meal of any kind whether on not it contained actual meat. Moreover with the discovery of earlier versions of Greek texts there is now thought to be many errors in translation from the original Greek and in many instances it has been shown that the word “meat” is amongst these errors in translation. The majority of words incorrectly translated as “meat” are trophe, meaning nourishment and broma meaning food and other words such as bromis the act of eating. Eating, slaughtering and mistreating animals goes against Gods ultimate goal for our world and that is as a place of peace, peace for all creatures. This ideal is often much quoted and should be familiar to both Christianity and Judaism, yet many ignore this; it is a prophecy from the book of Isaiah. Isaiah was a prophet in the 8th-century BC Kingdom of Judah. Isaiah 11:6-9 Christian Bible old testament. 6. And the wolf will dwell with the lamb, And the leopard will lie down with the kid, And the calf and the young lion and the fatling together; And a little boy will lead them. 7. Also the cow and the bear will graze; Their young will lie down together; And the lion will eat straw like the ox. I would appreciate it if you took the time to read the above. Concerning the peaceable Kingdom : The peaceable kingdom described in Isaiah’s vision is a far cry from the state of affairs that exists today. Often the excuse to overlook this is that these events will take place at a future time and will be orchestrated by God. Christians seem to think that we have no role to play in this transformation. Certainly we can do little to bring about peace for instance between a wolf and a lamb but we certainly have the power to bring peace between our selves and all living creatures. This is what Christians believe God wants for this world, therefore to blatantly and consistently go against His ultimate goal to bring about His peaceful kingdom into existence surely goes against the will of God. How can we have a peaceful world when we kill billions of sentient beings to sate our appetite for meat. Ask yourself: Do you really think that God approves of factory farming? Ask the question would Jesus work in a factory farm or slaughter house? No, of course not, indeed the concept is ludicrous, almost blasphemous. According to Christianity, the message of Jesus is one of love, peace, compassion, kindness, and non violence. According to most Christians the end objective of the second coming of Christ is to bring about peace, a new era of non violence and a paradise on earth. Surely in this new paradise there is no place for a factory farm or for eating the dead flesh of another thinking feeling living being no matter how well looked after. Can you envision a paradise where tiny new born lambs, calves and piglets will be taken away from their mothers, loaded into lorries taken to places where few know the location of and cruelty slaughtered. As for the over population. There are millions of farm animals simply because they have been bred to feed the growing population and that is the real nightmare. If you believe in a compassionate God how can you believe that he would wish the slaughter of billions of animals year after year? You ideas are simply not logical let alone conducive with the concept of a benevolent deity. “It is far better to be happy than to have your bodies act as graveyards for animals. Accordingly, the apostle Matthew partook of seeds, nuts and vegetables, without flesh. The unnatural eating of flesh meats is as polluting as the heathen worship of devils, with its sacrifices and its impure feasts, through participation in it a man becomes a fellow eater with devils. I hope one day you will realise the awfulness of killing thinking feeling living beings regardless of how well they are cared for. The vast majority suffer terribly. No one has the right to kill any animal. Time to stop eating meat. Couldn’t agree with you more well said !!!!! !Now how do we convince the population ??? Expose this as much as possible.Maybe we can get the rest of the world to go VEGAN !!!!! Put this in the news paper !!!!! This horrible cruel situation has to be dealt with !!!!! As soon as possible !!!! !Many will agree !!!!! Thank you for your comment. Convincing the population will never be easy, as you say exposing the reality of the situation and the treatment of animals and maybe in time more and more people will stop eating meat and consuming dairy products and other animal derivatives. Thankfully more and more people are going vegan. I wish there was more expose in newspapers as people need to know what happens to animals in factory farms. If people seen the reality of dairy they would be put off. But we have been brainwashed by images of cows skipping across beaches eager to give us their milk. Even I have raised my kids telling them ‘drink your milk, its good for you’ ! What I think is so wrong too is the fact that these babies are in the care of men, these are mainly young men who are eager to prove themselves as being tough and hard! I’ve seen many videos of these men punching, kicking, throwing calves around. These men should never be in this situation of looking after babies, I mean would you let these people babysit your children. No! But who else would want to do this job? It shouldn’t be legal in the first place on the grounds of it being so cruel. You’re RIGHT ! GO VEGAN !!!!! !That is the answer !!!!! I do so agree with your comment concerning the false image of happy cows eager to give milk, we are brain washed concerning the dairy industry. The reality as you have pointed out is quite different and cows and calves are very much abused in order to provide people with milk a product which they do not need. I agree that many of the actions of people responsible for these animals are shockingly cruel and it needs to be stopped. The whole dairy business needs to come to an end, we do not need milk and no other species drinks milk after weaning and never the milk of another species. Thank you for you comment, it is nice to know someone cares and the more of us who do maybe one day such cruelty will come to an end. Thank you for your comment. I am now following animalistauntamed which I must say is an excellent blog.Thank you for following my blog. Please consider going vegan and help stop this barbaric exploitation of innocent and sentient living beings. I’m totally disgusted !! !SHAME on the humans responsible for this !!!!! !You are MONSTERS !!! This has to be STOPPED. GO VEGAN ! Stop eating meat and drinking milk. Lots of have. There is no need for it and this torture has to be stopped. We can live very healthy lives with meat and milk. Lots of us have ! TRY it,it is truly wonderful and much healthier !!!!! I like your comment. You are right there is no need to drink milk, no other animal drinks the milk of another species. We can in fact live much healthier lives without either milk or meat, neither are a natural diet for human beings. you made me cry. wish there was some other animal above man that could herd human beings in similar crates as you have shown. blame on Him who created man! Thank you for commenting. Yes if only man got a taste of his own medicine and was herded into these awful veal crates. Indeed it is sad and shameful how some people treat these poor defenceless animals. Wow. Just found this blog post by accident, but what a great article. And the response to the person who claimed it’s our God given right is very good. I shall read more of your work, but all I can say, thank you for such a thoughtful and well researched article. My own change of outlook came when I asked a simple question – why don’t I see pigs out in the fields, the way I see sheep and cows. What I learned has quite simply horrified me… But worse than that has been the complete disinterest others show when I try to tell them. Thank you for your comments about my article. It is a shame that few people ask this question and also shocking that few people show any interest when you tell them. Maybe the truth concerning the horrific treatment of pigs and other farm animals simply does not seem a reality or people have been conditioned to consider such treatment of animals as normal or our right. Sadly few people question much of anything and I am pleased that you did so. The life for a pig in a factory farm is a misery of torment and suffering that is often hard to imagine, the more we try to tell people the truth, hopefully in time more people will care, but it does seem a long process. I think people can’t comprehend how countries such as the UK and the USA to name but two allow such cruel inhumane treatment of animals. As for cows there are few of these left to graze in fields, those that are are slaughtered as soon as they cannot reproduce and provide milk. The vast majority of cows are stuck in windowless sheds in factory farms. Advertising adds to the misconception that cows are left to graze in fields in the sunshine when the reality is that most do not see the light of day until they are loaded into a truck and taken to the slaughter house.Again thank you for your interesting comment, I wish more people would ask a similar question. Thanks for a great resource in your website, Think Differently About Sheep. I need to spend some time reading through all your great material. There is research that shows how peoples’ perceptions of animals change depending on their feelings about the animals’ status or their intelligence. It’s surprising the extent to which human intelligence is considered such a benchmark and yet we try to treat members of our own species with care and compassion when their intelligence is substantially impaired. It’s interesting to consider our human ideas of nobility and virtuousness and evaluate how we apply these to anything not of our species. Perhaps most surprising for me is the extent to which the suffering of our food animals is simply ignored. I think people get it but in a sort of detached way. The thinking seems to be that we have to eat animals and while it might be a bit awful, it’s OK because that’s the way life works. Cultural conditioning and a relentless brainwashing by the industry is serving to perpetuate this entrenched thinking. Have you ever done a post about animals in the Bible, if you haven’t please do!